Hi! I would love to help you achieve your full music potential through a friendly and holistic music approach! Hello! I would like to tell you a little bit about myself! My name is Ariana Piknjač and I was born in 1995 and raised in Sydney, Australia. Since I come from a musical family, my musical story began when I was aged just 3 years and 9 months starting with piano lessons. I have a Bachelors degree in Music Theory and Pedagogy, contuining with my Masters studies from this year. I am also currently studyig Flute performance in the class of prof. Sakib Lačević. I have performed at various concerts in different countries and have worked with various music professors from Austria, Serbia, Australia, Italy, Bosnia and Herzegovina, Hungary, Russia and Switzerland. In my musical career so far, I have also performed with the Sarajevo Philharmonic orchestra and participated in Federal music competitions in the disciplines of flute, choir and chamber music being awarded first prizes. I am currently honorarily playing with the Sarajevo Philharmonic Orchestra second flute/third flute and piccolo flute. Teaching is very close to my heart, since my first teaching experience started when I was just 10 years old, assisting my father during the school holidays teaching youngsters piano. I really love teaching, all levels of playing, as it is one of my biggest passions! 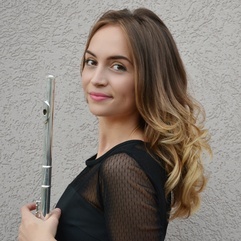 I currently teach flute with a fun and holistic approach, connecting with my students by bringing the flute and music in general closer to them and closer to their hearts. I also enjoy the creative process and sharing my music, so the perfect platform for this is Instagram. I run an Instagram profile based on sharing my flute journey through photos and videos and currently have over 28 thousand followers. You can find me on instagram by searching my username: @arianaflute. I believe in recognising a student's potential and all of their musical strengths and current technical weaknesses and working on them together with the student through a very fun, positive, kind and focused approach! I also believe that every musician should aim as high as they can imagine, dream big and always to remember that nothing is impossible!! I am an adult learner and really appreciate Ariana's way of teaching. She is a gifted communicator and has a very thorough and perceptive approach to teaching. She makes the lesson a very enjoyable and worthwhile experience. I have learnt a lot in a short time and I very much recommend her lessons. I like her a lot, for me she is one of the best. She is very talented, it's hard to find someone like her. Ariana is a gentle person and knows how to handle any one with a flute, beginner or expert, she can help them improve. Her classes are fun and full of joy. She is an amazing teacher. Ariana is a lovely, gentle, and talented young lady who has the gift of distilling complex musical ideas into straightforward and accessible lessons tailored to her students’ level and interests. She has a lot of patience and a remarkable talent of understanding her students’ learning curve. We highly recommend her for young children and adults alike, as she is great at inspiring her students’ musical growth. She has an amazing relationship with music and works to teach her students to enjoy and love music, not just the instrument. Her classes are full of joy and laughter. Take live online video lessons with professional, passionate Flute , Piccolo flute or Flute, Alto teachers from around the world. All you need is a computer equipped with a webcam and microphone. Learn more about how it works.